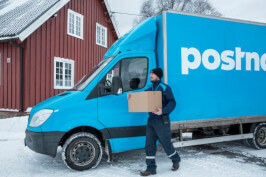 For more than a decade now, PostNord has commissioned a yearly study of the Nordic e-commerce market. 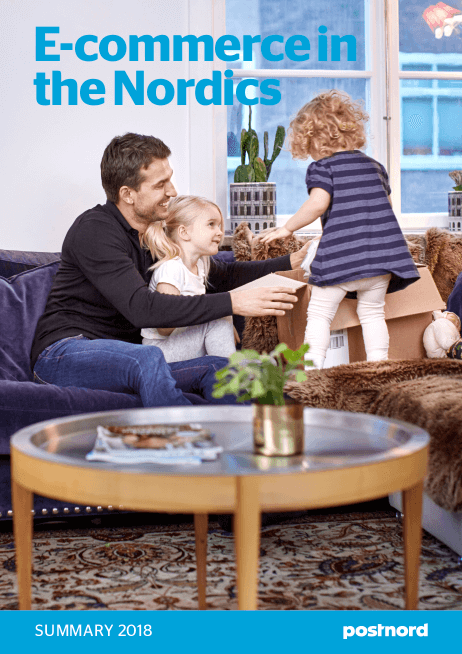 The report “E‑commerce in the Nordics 2018 Summary” (published in March 2019) is based on surveys with consumers aged 18-79 years conducted monthly in Denmark, Finland, Norway, and Sweden. The total number of respondents is 89 000. The report contains detailed information on both the Nordic market as a whole, as well as the four Scandinavian countries individually. Here are some findings from the new study. The total value of physical products bought online during 2018 is estimated at EUR 22.4 billion. 16 % came from purchases made from foreign e-commerce markets. Sweden, the largest country in the region, is responsible for the biggest part of the total spending while Denmark and Norway show the highest average spending per capita with EUR 223 and EUR 218 respectively. Finland has the lowest average spending per capita, but on the other hand the highest share of residents buying products from abroad. Nordic countries differ when it comes to shopping from other markets than their own. Finnish and Norwegian consumers have a habit of shopping from abroad, while Danish and Swedish consumers rely on domestic web shops to a greater extent. When the Nordics make purchases from outside the region, they prefer to buy from China, the United Kingdom, Germany and the US. Online customers want to be in the driver’s seat and clearly state that delivery, and thus the task of shipping companies, is central to the purchase experience. Swedish consumers stand out by their high use of service points and when it comes to wanting to choose the delivery date. Finns have a strong desire to be able to change the delivery method after placing an order. Norwegians consider it important to be offered free shipping, while Danes are the ones with the highest demand for fast deliveries. The new report can now be ordered free of charge. The UK is Europe’s leading e-commerce nation and considered by many to be the most developed e-commerce market in the world. The country is far above the European average for the number of e-commerce consumers, Internet penetration and, above all, average spend per year. Growth in the number of new online consumers has been below average, at 17 percent between 2014 and 2018, which is to be expected in such a mature market. The products most commonly bought online are clothes and footwear, home electronics, and books. UK consumers are active in several niche product categories, which illustrates how widespread and commonplace online shopping has become. People buy everything from flowers to car accessories online. This is the type of consumption that is needed if e-commerce is to carve out serious market shares in the total volume of purchases. One product category that has reached an extreme level, compared to other countries, is food. In the UK, 34 percent of consumers buy food online, much higher than in other European markets. 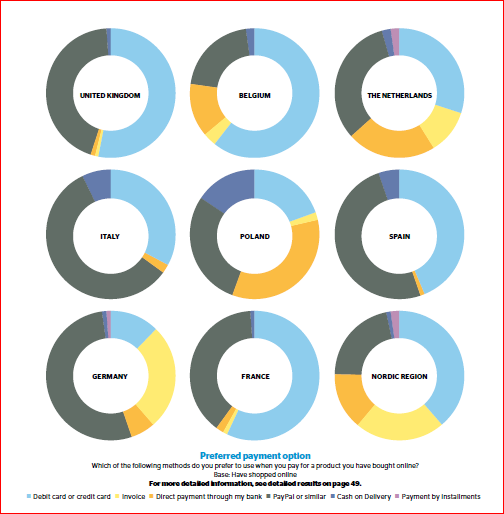 UK consumers buy from abroad at about the European average, primarily from China and the US. Growth has above all been in purchases from China, which is now the largest market for imports measured in numbers of goods. A factor of relevance with regard to the British buying from abroad will be Brexit, which is likely to affect the UK’s e-commerce exports and imports with Europe. The Nordic countries were early adopters of the Internet and have a highly developed digital infrastructure. The Nordics are above the European average for the number of e-commerce consumers, internet penetration and average spend per year. Growth in the number of new e-commerce consumers has been relatively weak at 12 percent, which is to be expected in a mature market where the majority already buy online. The products most commonly bought online in the Nordic region are clothes and fashion, home electronics, and cosmetics. To date, no platform or market place operator has established a presence in the Nordics. This means the Nordic countries have not yet been able to fully share in the benefits that truly large scale platform operator’s offer, such as free shipping and same-day deliveries. The absence of these global giants, in combination with large geographic distances, is probably one explanation why Nordic consumers are willing to accept relatively long delivery times. The Nordics are the countries in the survey that buy the most from abroad. 83 percent of the consumers who have bought online say that they have also made purchases from abroad. The foreign markets mostly favored by the Nordic consumers are China, UK, Germany and USA. Even if not all the Nordic countries are EU members, they have their own reciprocal trade agreements, which favor e-commerce between the countries.